5 foot 9 inches tall, weight 160 pounds (73kgs), chest 34-361/2 inches, dark complexion, black hair, brown eyes, good teeth. 5 April 1916 - admitted 1NZ Stationary Hospital - deafness - 9 Apr transferred to NZGH, Cairo - 20 May transferred to Aotea Convalescent Hospital, Heliopolis. 10 October 1918 - admitted to Casualty Clearing Station (CCS) - sick - 19-21 October transferred 44th Stationary Hospital, Kantara. 11 December 1918 - admitted to 28 CCS Chanak (Turkey) tonsillitis - disc 1 Jan 1919. 22-29 January 1919 - admitted to 44th Stationary Hospita,l Kantara - tonsillitis. 28-31 February 1919 - aboard ship "Kaikoura" - sick. 21 March to 12 July 1920 - admitted to Military Sanatorium, Cashmere - tuberculosis. George Murray was born at Drummond, Southland, on 23 June 1895, eldest son of Michael (1874-1953) and Lilian Mary (1877-1909 nee Lucre). His father had married Lilian Mary in 1894, the daughter of Walter Edward (1846-1916) and Emily Sarah (1857-1929 nee Payne) Lucre. At the time of George’s birth the family was farming in the Drummond area. Young George attended the local Drummond School where he attained at least the 4th standard. George had been a member of the 7th Southland Mounted Rifles when, a few days short of his 20th birthday on 25 May 1915, he volunteered for service at Timaru. At this time he was working as a labourer at Albury for Mr J Austin, a local farmer, and gave his address as Washdyke. His father Michael of Drummond of Southland was nominated as his next of kin. On Saturday 29 May 1915, after a civic send off, he left on the train from Timaru for Trentham as one of the 120 local men who had recently volunteered for service. His description on his enlistment papers noted he was single, aged 19, Presbyterian, 5 foot 9 inches tall, weighed 160 pounds (73 kgs), chest measuring 34 – 36 ½ inches, had a dark complexion, black hair, brown eyes, and good teeth. On arrival at Trentham he was posted to D Company, 1 Battalion of the Trentham Regiment, and issued with his clothing, rifle and bayonet. He now began a life of living in old ex-Zulu War bell tents, 8 to 12 men sleeping in a wheel formation, with their feet pointing in towards the centre. 10 weeks of intensive infantry training followed learning basic drills, shooting, bayonet fighting, map reading etc, along with plenty of hard physical exercise. It was not all hard work as there was the odd spot of swimming in the local river, leave in Wellington, and inter unit sports. On 7 July he was transferred to 8th (South Canterbury) Mounted Rifles, a squadron of the Canterbury Mounted Rifle Regiment (CMR). In their final weeks they took part manoeuvres to practice what they had learned in training. Now ready for posting overseas, the men are issued with their full uniform and were granted a short period of embarkation leave. On departure they marched from Trentham through some of the streets of Wellington, then on to the harbour where the transports HMNZT28 “Tofua” and HMNZT29 “Willochra” awaited the 2,363 troops to arrive. On 14 August 1915, Trooper Murray boarded the “Tofua” to begin his journey to Suez, Egypt, in convoy with “Willochra”. They stopped at Albany, where they undertook a route march to stretch their legs, then re-boarded the ship, carrying on to Colombo for refuelling. During the voyage they cleaned, exercised, and took part in rifle drills. Boxing was a popular sport aboard, one which all could take part as the men were matched with others of the same size and ability. The ships passed through the Red Sea to Port Suez, arriving on 19 September 1915. From here they took the train to the training base at Zeitoun where training continued day and night. The Canterbury Mounted Rifles already on Gallipoli had suffered many casualties, and were in desperate need of reinforcements. On October 3, Trooper Murray joined what was left of his unit at Mudros, where they were having some well-earned rest from the peninsula. On 10 November the CMR embarked on HMT “Osmanich” to return to Anzac Cove where they took up positions in Waterfall Gully. On 27 November they relieved the Suffolk Yeomanry and part of the 162nd Brigade, on the northern side of the Aghyl Dere. By now a decision had been taken to evacuate the peninsula but the troops still had the storms, snow, and the Turks to put up with for another few weeks, having a miserable time of it. Finally between 15 and 20 December, the evacuation of 36,000 troops was successfully carried out. The final party of CMR left during the night of 19/20 December for Lemnos, and embarked on HMT “Hororata” for Alexandria on 22 December. New Zealand lost 2,779 men during the campaign, about one sixth of those who fought there. Trooper Murray disembarked at Alexandra on 26 December 1915, returning by train to the camp at Zeitoun. Training resumed and, on 23 January 1916, they took up a new defensive position on the Suez Canal, moving to the front line at the railhead at Ferrypost on 7 March. On 5 April George Murray was admitted to No 1 NZ Stationary Hospital at Ismailia suffering from deafness. Transfer took place on 9 April to the NZ Gen Hospital at Cairo. He was then sent on 20 May to the Aotea Convalescent Hospital at Heliopolis diagnosed as suffering from neurasthenia, to await his return to New Zealand. On 26 June he left from Suez aboard “Navua”, arriving at Port Chalmers on 9 August 1916. George was discharged from the army on 5 September 1916 as no longer physically fit for war service, on account of illness contracted on active service. 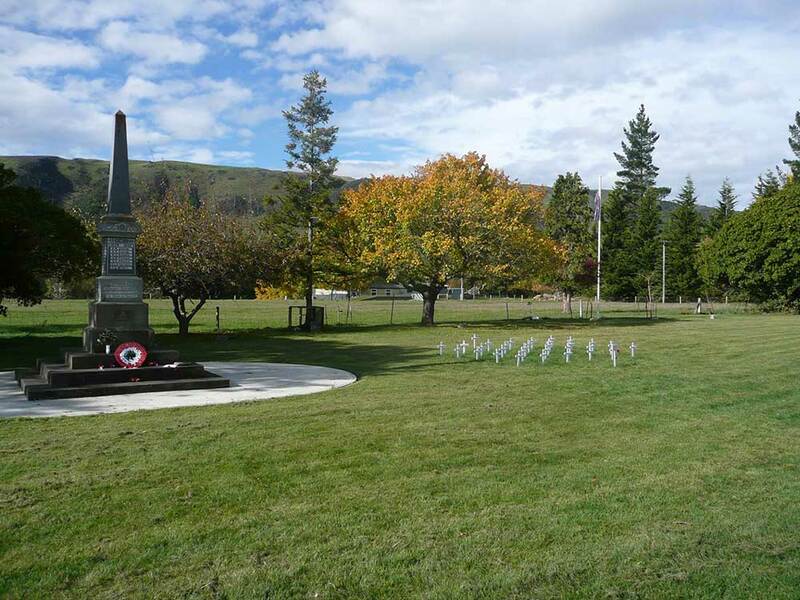 George returned to the South Canterbury district where he lived in Temuka, working as a labourer for Mr J Kelman at Washdyke until he again volunteered for service on July 11, 1917. Prior to leaving for camp for the second time, he married Miss Olive Irene Roulston on 8 August 1917 at Temuka. Olive was the daughter of William Clark and Rosina Allen (nee Dale) Roulston. The Rev C McDonald performed the wedding service. 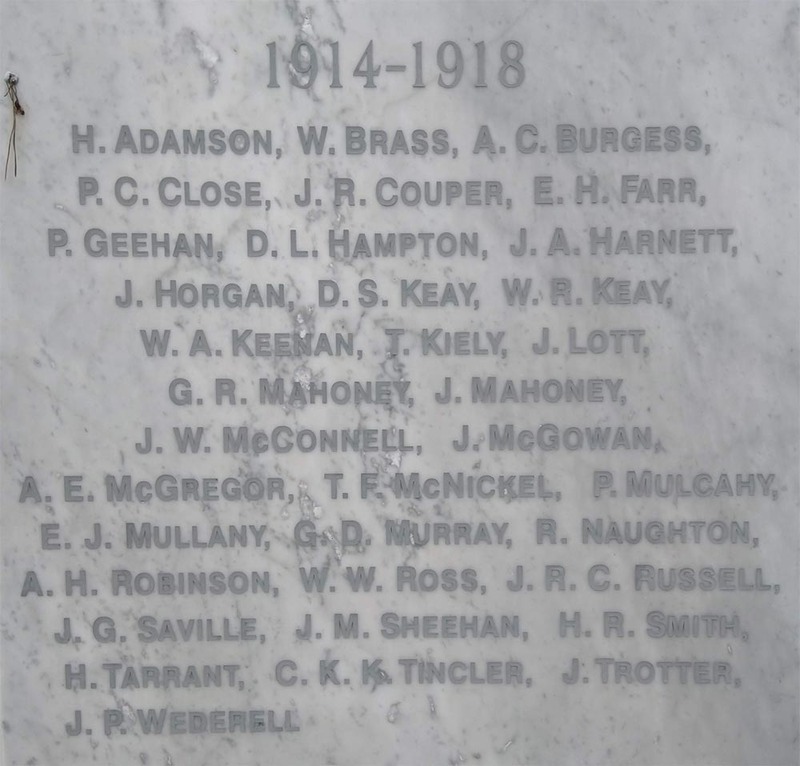 Following public farewells from the people of Temuka, George was one of the eighteen volunteers for the 33rd Reinforcements who left Temuka on 20 August. Once again he undertook infantry training at Trentham and Featherston, leaving there by train for Wellington on 12 November where they boarded HMNZT98 “Tofua”. Leaving the next day, they sailed for Suez in Egypt, with the usual stops at Albany and Colombo, disembarking at Suez on 21 December 1917. On arrival Trooper Murray was posted to the Training Regiment at Moascar. Later on 14 April 14 he was again posted to the CMR’s 8th (South Canterbury) Squadron as a reinforcement in the field. On 30 April the Second Raid on Amman took place, after which the CMR moved on toward Bethlehem. On 27 May the 8th (South Canterbury) Squadron moved to the Desert Corps School of Instruction at Richon le Zion for a tour of duty, returning on 10 July. Fighting continued in the Jordan Valley/Bethlehem area, and on 24 September took part in the third raid on Amman. By this time so many men of the allied forces had been evacuated to hospital with malaria and influenza that it was almost at the point of stopping all military operations. It was fortunate for them that the Turkish forces were almost largely defeated. Thousands from all sides were to die of the combined effects of influenza and malaria. Trooper Murray was admitted to the Casualty Clearance Station (CCS) on 10 October, and he was transferred to the 44th Stationary Hospital at Kantara on 19 October. Discharged back to duty on 21 October, he was posted to the NZ Mounted Brigade at Ismailia. The war ended in the Middle East soon after on 31 October. 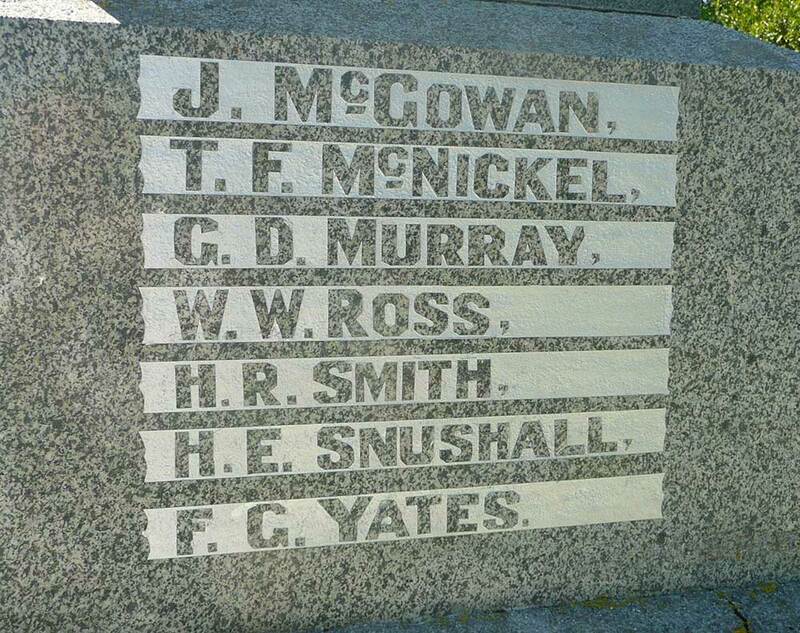 In November Murray’s unit was selected to be part of the Allied force of occupation on the Dardanelles Peninsula. On 28 November 28 they left Egypt, arriving at Maidos on 5 December. Unfortunately, on 11 December, Trooper Murray was admitted to No 28 CCS at Chanak (Turkey) suffering from tonsillitis, suffering for a month before being discharged back to duty on 1January 1919. On 19 January the majority of the regiment returned to the brigade at Kantara and soon after (22-29 January), Murray was again admitted to the 44th Stationary Hospital at Kantara with tonsillitis for a spell, before being posting to the Training Regiment at Ismailia. On 3 March 1919, at Suez, Murray was part of Return Draft 230 that boarded the transport ship “Kaikoura” for his return home to New Zealand. Whilst on the journey home he had another short spell in the ship’s hospital (28-31 February). Finally, after arriving at Wellington on 17 April 1919, he was granted leave followed by final discharge from the army on 18 May 1919. By now George’s family was living at 24 Heyward Terrace, Christchurch. George took up employment as a labourer, but his health gradually deteriorated due to sickness contracted overseas and he was treated from 21 March to 12 July 1920, at the Military Sanatorium at Cashmere, for TB of the lungs. He found he could not settle at the Sanatorium, and was discharged to his home at his own request. George died at the Christchurch Hospital of as the result of this sickness at the young age of 26 years on 24 October 1921. He was buried in the Bromley Cemetery and his name was inscribed on the Albury War Memorial. Having served a total of 3 years and 27 days, his family later received his war medals which included the 1914-1915 Star, British War Medal and Victory Medal. George’s son went on to serve in the Second World Ward. C/5466 Able Seaman Gordon Murray RNZNVR, was tragically one of 150 New Zealanders lost at sea on 19 December 1941 when HMS “Neptune” struck mines 20 miles from Tripoli.